Greyhounds are elegant dogs with very low body fat levels and unique blood chemistry. They can be prone to obesity and the pups have very particular dietary requirements when it comes to protein. They do well on commercial dog foods but dried kibble of an exceptional quality is what suits them best. There is a lot of choices when it comes to commercial dog food for Greyhounds. As an owner, you need to get used to reading and interpreting ingredients lists to make sure that you are buying the best for your dog. To help you choose, we’ve prepared a useful guide to the best dog food for Greyhounds. 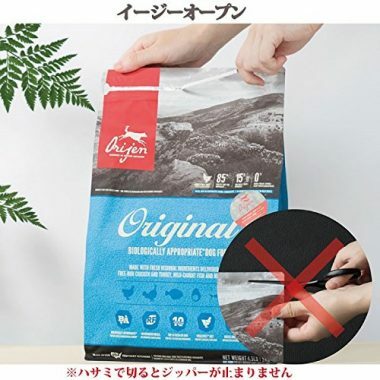 This is a gently freeze-dried dog food made from very carefully selected ingredients that are both fresh and regional to ensure a top-quality product. It consists entirely of fresh, raw or dehydrated animal ingredients and absolutely no rendered poultry, fish or meat meal. It’s packed with high-protein ingredients and contains a minimum of 85% poultry, fish or eggs. There is also a minimum of 15% vegetables, fruits or botanicals so there is a high plant-based protein content as well. 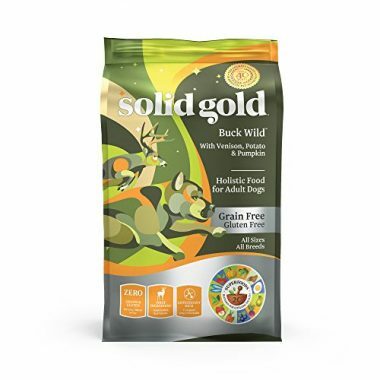 The formulation is completely grain-free and so will suit Greyhounds with allergies but there is also no tapioca, potato or plant protein concentrates. The high protein content is provided by free-run chicken and turkey, wild-caught fish and nest-laid eggs so the sources of meat and fish are very ethical. A natural dog food that is further fortified with essential vitamins and minerals for overall health. 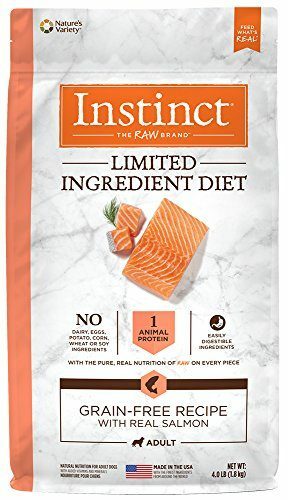 This formulation is protein-rich and grain free – based on meats that dogs would naturally eat in the wild. 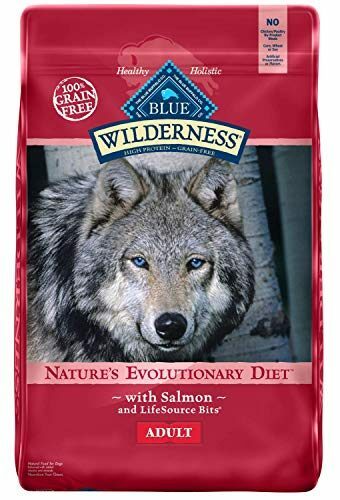 The recipe has been developed by animal nutrition experts and is based on the diet of wild dogs and wolves. Protein, fat, and carbohydrates are carefully balanced and blended to give all-round nutrition. The protein (minimum 34%) is provided by de-boned salmon, chicken-meal and fish-meal. The complex carbohydrates are provided by peas, potatoes, and sweet potatoes. The antioxidants are provided by carrots, blueberries, and cranberries. Added to this, is the exclusive LifeSource bits formula which is a special blend of vitamins and minerals. There are no chicken by-products, no corn, soy or wheat, and no artificial colors or preservatives. It is suitable for all life-stages and breeds and for dogs who suffer from allergies. A balanced and holistic food for dogs of all ages, sizes, and breeds. The kibble has a high protein formulation that makes up 34% of the total weight. The protein is provided by salmon, whitefish and sweet potatoes. Further nutrients are provided by ‘super’ foods such as lentils and garbanzo beans. Omega 3 and omega 6 is provided by flaxseeds and fish oils and the digestive enzymes and prebiotics and probiotics are there to support your dog’s digestion. This is suitable for pups, adult dogs and seniors. You can safely feed it to dogs with allergies as it contains no artificial flavors, colors or preservatives, and no corn, wheat, rice or soy. There are no fillers of any kind (including white potatoes) which leaves more room for the nutritious ingredients. Red meat and poultry recipes are also available. An adult dog food for all breeds that is completely natural and totally nutritionally balanced. There’s a minimum of 23% protein thanks to the venison, turkey meal and eggs. The fat content is 12% and the fiber content is 4%. Added ocean fish meal provides plenty of omega oils to boost your dog’s immune system. There’s no shortage of nutrients as the recipe includes no fewer than 20 superfoods including pumpkins, blueberries, broccoli, and kelp. It contains no artificial ingredients of any kind, it’s all natural. There is also no corn, wheat or soy so you do not have to worry about allergic reactions. The recipe has no meat by-products. A chicken-based recipe formulated specifically for puppies. 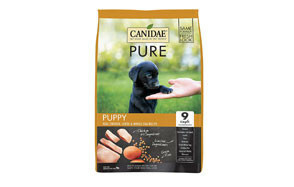 It provides the essential nutrients that pups need for growth and their high energy needs. There’s a minimum of 30% protein and 12% fat. The high-quality protein is provided by only fresh chicken (not by-products) and fish-meal. Further essential nutrients are provided by natural ingredients including lentils, peas, potatoes, and flaxseed. Probiotics are added after the kibble has been cooked and they support your dog’s natural digestion processes. The added antioxidants support their immune system and the omega 6 and 3 keep the skin and fur healthy. It also has added vitamins and minerals and natural flavors. 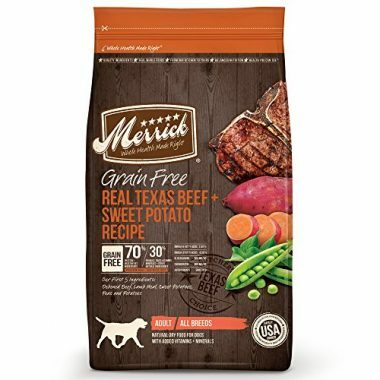 This is a high-protein Greyhound food with a minimum of 38% crude protein that is primarily provided by Texas deboned beef sourced locally to where the food is manufactured. Proteins and healthy fats make up a massive 70% of the total weight of this dog food. Further protein is provided by lamb meal and ingredients such as sweet potatoes, peas, apples, and blueberries provide more nutrients. To further promote skin, fur and joint health and condition, omega 6 and 3 fatty acids, glucosamine, chondroitin, and fatty acids are included in the recipe. 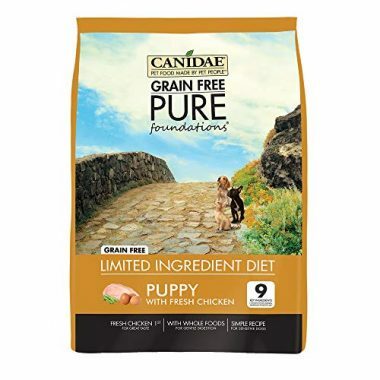 It contains no grain, gluten or poultry and is safe for dogs who are sensitive to these ingredients. 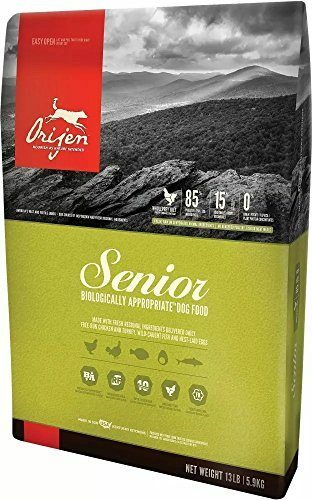 This recipe has been biologically formulated to be suitable as a retired greyhound food for senior dogs. It has a limited calorie content and only 19 % low glycemic carbohydrates so it helps to tackle obesity in older dogs by supporting them to maintain a healthy body weight. The freeze-dried liver flavor will also help to tempt older dogs who have lost their appetite. The 38% protein is provided by chicken and turkey meat as well as highly nutritious chicken livers and hearts. There’s also a high fish content including fresh whole herring, whole mackerel, and whole sardine. The recipe is packed with fresh vegetables to provide high levels of nutrients including chickpeas, butternut squash, and kale. All of the ingredients are sustainably fished or farmed and there are no preservatives. Limited ingredients dog foods cut down on the number of ingredients that your dog is exposed to and reduces the chances of them suffering an allergic reaction. This formulation is specifically designed for large breeds as it encourages them to chew their food properly and so eat slower. It also helps to keep the teeth and gums healthy by scraping off plaque. It contains a minimum of 21% protein and 12% fat. The only source of meat protein is lamb and lamb meal. The other ingredients are brown rice and rice bran, dried tomato, and yeast. 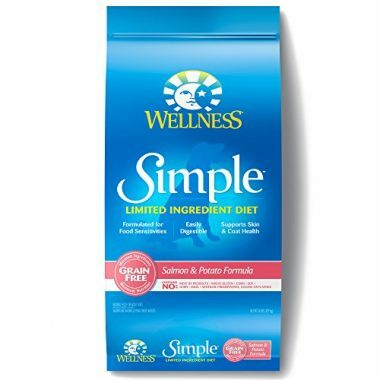 The feed is fortified with a wide range of added vitamins and minerals to support health. There are no artificial colors or preservatives. 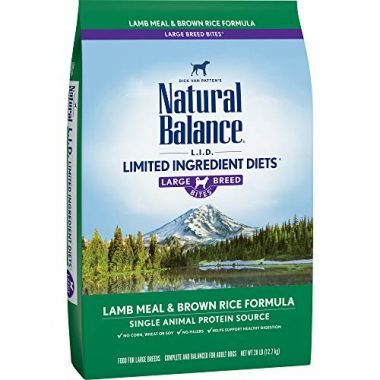 For Greyhounds that have food sensitivities, this food delivers all of the nutrients that they need yet is gentle on their stomach. It contains none of the ingredients that can cause digestive problems so there are no meat by-products, wheat, soy, dairy or egg products and there are no artificial colors or preservatives. This formulation is suitable for adult dogs only and has a minimum of 25% protein. Instead of meat, the protein is provided by salmon. The carbohydrate content is easily digestible and is provided by potatoes and peas whilst a natural probiotic (chicory root) is added to promote a healthy digestive system. Flaxseed is also added for healthy skin. A simple and wholesome food based on one animal protein and one vegetable. Animal protein (27%) is provided by salmon which is wild caught. Peas provide the carbohydrates and there are added vitamins and minerals as well as coconut oil. Omega fats are added for healthy skin and coat and antioxidants are added for a healthy immune system. The kibble is suitable for Greyhounds of all sizes and is coated in a freeze-dried coating of raw cod which is both nutritious and delicious. It contains no grains, potatoes, soy or animal by-products. There are also no fillers or artificial ingredients. Greyhounds need a high protein diet to make sure that their cells can grow and repair. Protein should be provided by high-quality meat or fish sources. A single source is useful if your dog has allergies. These give your Greyhound energy to run around. However, if they have too many of them, they can become obese and there can also be issues with allergies. Some dogs are allergic to wheat and corn. Preferable alternatives are sweet potatoes and peas. Probiotics. Some dogs suffer from digestive issues and will benefit from probiotics which promote healthy digestion. Fats are another essential source of energy. Special fats called omega acids are needed for a healthy metabolism and for skin and fur condition. Vitamins and minerals. A balance of vitamins and minerals is essential to keep your Greyhound healthy. Commercial dog foods are usually fortified with vitamins and minerals. Greyhounds are not usually greedy eaters. Senior dogs may need some persuasion to eat and taste will be important. Commercial dog foods can use herbs or meat or fish extract to make them even more delicious. Greyhound pups are very active and need a lot of calories in their diet to keep them going. An average adult Greyhound dog weighing 70 pounds will need around 1740 calories a day but a young adult needs 1876 calories per day. Pups are also growing and developing rapidly so they need a diet that has plenty of high-quality protein. The Association of American Feed Control Officials recommends that food for Greyhound pups contains a minimum of 22 % protein and food for adult dogs contains 18 % protein. Fat is essential for energy and Greyhound pups need a diet that contains at least 8 % fat and adult dogs need at least 5 % fat. Greyhounds as a breed do well on a meat-based diet. This can be provided by a raw diet or by commercial dog food. Puppies can benefit from Docosahexaenoic acid which helps brain and eye development. Older dogs need medium chain triglycerides found in coconut oil which helps them to act younger. 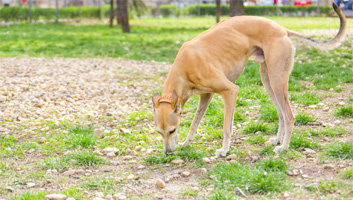 The best food for greyhounds is one that is formulated for larger breeds. A large breed puppy food is essential because the growth plates in Greyhound bones continue to grow for two years. They need a food that promotes slow growth to avoid joint problems. Greyhound pups need a diet that balances the calcium to phosphorus ratio and keeps the protein and calorie content slightly lower to slow down growth. Very high protein foods are not suitable for Greyhound pups. Feeding cheap commercial dog food to a Greyhound is not advisable. They have special blood chemistry and very little body fat and are very sensitive to what their diet contains. A very high-quality food is required to keep them healthy. Pups need three meals a day and adult dogs need two meals. Discard the food if it is not eaten after half an hour. Free feeding is not recommended as Greyhounds can become obese. However, Greyhounds that are racing competitively have special feeding schedules. There are a few ingredients that you should avoid in the best kibble for Greyhounds so read that ingredients list carefully. Low-quality protein. Some protein sources are better than others and Greyhounds will not be able to tolerate low quality protein. Whole meat (beef, chicken, lamb) or fish and meat meals are high-quality sources. Meat meals are a concentrated meat where the moisture has been removed and are protein-rich. Low-quality fats. Fats are essential and some vitamins are fat-soluble. However, if the fat source is not named you should be wary. Look for names such as ‘chicken fat’ on the ingredients list. Fish oils are another good source of fat and contain omega fatty acids. Grains. Many owners prefer to avoid corn, soy, and wheat in dog food because they can cause allergies. There are plenty of easily digestible alternative carbohydrates including peas and sweet potatoes. Additives and preservatives. These are usually artificial ingredients and are best avoided. These simple make up the bulk and give little nutritional benefit. 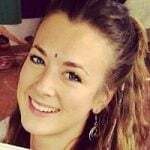 These are best avoided. In the US, Greyhounds are either registered with the American Kennel Club or with the National Greyhound Association (NGA). NGA registered greyhounds are competitive racing dogs and tend to be shorter and have more pronounced musculature. They usually retire at around two to four years of age and become family pets. You should be on the lookout for obesity as they can be prone to it and they do better on two meals a day rather than one. Many owners are confused about what is the best dog food for Greyhounds when it comes to wet or dry foods. Commercial wet dog food can upset a Greyhound’s stomach and they tend to do better on dried kibble. You can add a little-minced chicken or fish if you want to make it more exciting. Also, Greyhounds are one of the breeds that are especially susceptible to dental health problems. The best dog food for Italian Greyhounds will be dried kibble which are good at helping with dental issues because they will scrape plaque off the teeth whilst your dog is eating. The build-up of plaque is avoided and gum disease is less likely. The best dry dog food for greyhounds is a freeze-dried kibble made from fresh, regional ingredients. It contains no poor-quality poultry, fish or meat meal. The ingredients are 85% poultry, fish or eggs, and 15% vegetables, fruits or botanicals. 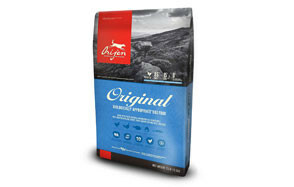 We are talking about the Orijen Original Dry Dog Food. The recipe is completely grain-free so allergic reactions can be avoided and there are no tapioca, potato or plant protein concentrates. 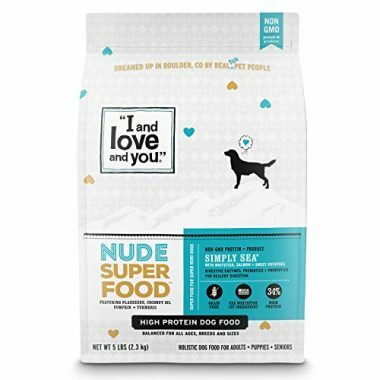 The meat in this kibble Greyhound food is very high quality and is provided by free-run chicken and turkey, wild-caught fish and nest-laid eggs.